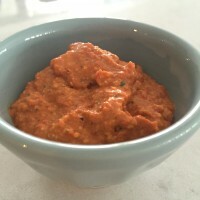 Romesco sauce is so versatile and a jar will last in the fridge for a week or two. I love having it on hand to add to pasta, spoon over fish or chicken, spread on toast or dip raw veg or bread sticks into. It is swoon-worthy with poached eggs and avocado on toast for breakfast. Add some bacon and you’re laughing. 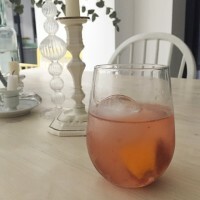 Try this with my favourite new cocktail… In an ice-filled glass, mix a shot of chilled Fino sherry with Fever Tree tonic water and a wedge of orange. Delish. Slice and freeze the bread ahead of time. Get the bread onto a baking sheet before your guests arrive. Make the romesco up to a week in advance. Keep in the fridge but bring out to come to room temperature before serving. Roast your spring onions earlier in the day and reheat when you toast the bread. A loaf of sourdough, sliced. Or a sliced loaf of wholegrain or rye sourdough. Something gutsy. Blitz the nuts in the food processor with the garlic. Add the peppers, tomato purée, smoked paprika, a quarter teaspoon each of salt and pepper, half of the vinegar and all of the olive oil. Blitz until you have a smooth purée. Taste and add more vinegar, salt and pepper as needed. You want this to be verging on being too acidic as it will be balanced out by the food you’re serving it with. Preheat the oven to 200°C (180°C fan) 400°F (360°F convection). Wash the spring onions. Then, without chopping the ends off, rub them with a little olive or rapeseed oil and put them in the oven on a metal baking sheet. Sprinkle a big pinch of sea salt flakes over them. You could also dust them with smoked paprika if you like. Roast for 10-15 minutes or until they are soft and starting to turn dark at the edges. Use scissors to cut each onion into 3 pieces, I leave the root on as it looks pretty but you may not agree! Slice your bread into 1cm thick slices and then either bake in the same oven as the onions, or toast (I prefer it toasted under the grill or even better on the BBQ in summer). Lay the bread, toasted side up on a platter or board. 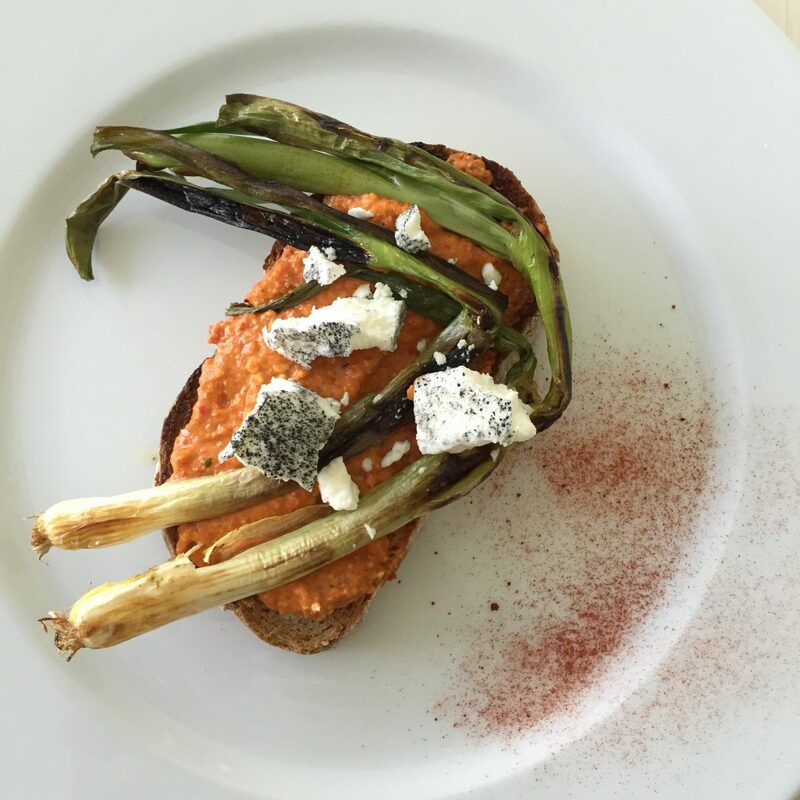 Spread the bread with the romesco then scatter the spring onion pieces on top and finish with crumbled goats cheese. Add a final grind of black pepper over everything and a drizzle of good olive oil if you’d like then serve immediately. If you prefer to serve a plated starter, scatter some rocket or watercress on a plate, sprinkle it with olive oil and sherry vinegar then crumble the goats cheese over it and dot blobs of romesco on top. Serve with sourdough bread that you’ve toasted, then drizzled with good olive oil and gently rubbed with a garlic clove. A dust of smoked paprika on the edge of the plate is pretty. Find more recipes for romseco, sauces, almonds and appetizers/starters here. Sign up for my monthly meal plan and recipe service here. If you’d like to get my newsletter every couple of weeks, packed with recipes like this and news of my events, please sign up here.